Iowa's presidential caucuses are typically a gray-haired affair, but this year candidates are working to entice college students and even high school kids to show up. In the past two presidential caucuses, nearly 65 percent of participants were older than 50. Yet John Edwards, Barack Obama and Hillary Rodham Clinton are betting that even a few new faces could sway a close contest. They're putting their faith in people like Chris Elsenbast, a 17-year-old high school senior in Ames, a college town just north of Des Moines. Elsenbast is head of Iowa State University's chapter of BarackStars, an organization set up by the campaign with groups throughout the state. "I agree with a lot of his policies, but I think he is really like a different type of politician," said Elsenbast, who will turn 18 before the caucuses and plans to support Obama. Ryan McNulty, a 17-year-old whose birthday is in December, has volunteered for the Edwards campaign and plans to support him at the caucuses this winter. The senior in Norwalk, a suburb of Des Moines, became interested in Edwards after discussing the candidates with his government teacher. "He's the most genuine of all the candidates," McNulty said. "He represents the common person better than the others." In seeking student support, the Obama campaign looks first for leaders whose participation could prompt others to take part. "From the debate team to the student council to the football quarterback, we are looking for leaders," says campaign organizer Steve Hildebrand. "There's no question we want to find students who have influence over other students." 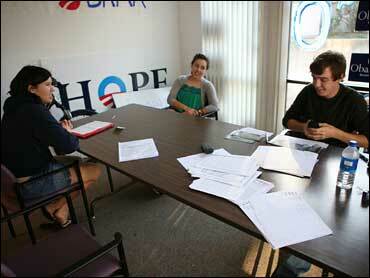 Iowans in their teens and early 20s seem especially fertile ground for Obama, who has drawn huge crowds at colleges. "The key for us is building an organization that can harness that enthusiasm and turn it into support," said spokesman Tommy Vietor. If history is any indication, that will be quite a chore. In 2004, only about 17 percent of Democratic caucus-goers were younger than 30. Attending the caucuses, held in each of the state's 1,784 precincts, can be intimidating to newcomers, unaccustomed to publicly declaring their preferences for a candidate and bargaining with others. Still, it's not new for candidates to seek a youthful boost, said Dennis Goldford, a political science professor at Drake University. "There's a history of trying to turn them out," said Goldford. "There's not much success in that." The campaigns recognize the challenge but contend that this time might be different. Considering that only a small percentage of Iowans - about 90,000 Republicans in the last contested election in 2000 and 124,000 Democrats in 2004 - take part in the caucuses, even a small bump in the number of participants can make a difference. In addition to Obama's creation of BarackStars, Clinton has announced a group of college student supporters, called "Hill Yea!" The candidates also are making pitches to young people through Web sites, text messaging and on popular networking sites such as MySpace and Facebook. Edwards' daughter, Cate, recently held two days of events at Iowa colleges and other young people's locales with James Denton, who stars in ABC's "Desperate Housewives." For some, it's policy rather than personality that has made the difference. "What really attracted me to the Edwards campaign was the fact that John Edwards has been working very hard to make it easier for people to go to college," said Michelle Wilkening, who heads Cyclones for Edwards at Iowa State University. "I'm a single parent and I'm going to school full-time and it seems like every time I turn around the government is making cuts." Eric Benson, a student at Wartburg College, echoed that argument. "It's so hard to afford college and he has a specific plan," Benson said. Candidates hoping for a strong student turnout are facing another question: The caucus date remains uncertain, but it is likely to be during colleges' winter break. That means students will be scattered to the winds. Vietor, with Obama's campaign, said the break could prove beneficial because many students are concentrated in a handful of precincts where their impact can be diluted - in five precincts in Iowa City, for example. They could make a bigger difference back home, he said. The situation gets complicated for people such as Lynell Wagenman, a Drake University student from North Dakota who supports John Edwards. She plans to return to Des Moines for the caucuses and expects other students to join her. "I'll be coming back and I'm sure I'll be housing other students on my couch and my floor," she said. "Some people at the university are working on having the dorms open for a limited amount of time." If the candidates succeed in altering the demographics of caucus attendees, it will be a shift of historic proportions, Goldford said. The last candidate who succeeded in ushering in a large group of newcomers was Pat Robertson, who turned out thousands of evangelical voters. There were similar expectations for Howard Dean's 2004 Internet-driven campaign that targeted new voters, but after leading in the polls and the money race, he finished third in Iowa and his presidential hopes quickly evaporated. "These are people who tend not to turn out, and the big question is can they get them to turn out," said Goldford.